Crash landed on Earth, an alien stepped out onto an arid, rocky bajada and found himself dwarfed by gigantic, grotesque, green figures with arms reaching toward the sky. Feeling at home in this weird landscape, he approached one fiercely armored mammoth, which he estimated to be 35 feet tall and weighing several tons. "Where am I on your planet?" he questioned the giant. The strange green figure remained silent. Where was the alien? By the distinctive characteristics of the peculiarly human-like plant, he could have only been in the Sonoran Desert. His geographical location could be pinpointed to be either in extreme southeastern California near the Colorado River, in southern and western Arizona, or south of the border in northwestern Mexico. These are the only places on earth where the saguaro cactus -- grand symbol of the Sonoran Desert, the West and arguably the United States -- grows. The word saguaro, pronounced, "sah-wah'-ro," came from a Spanish mispronunciation of an ancient Papago word referring only to this species of plant. Its scientific name, Carnegiea gigantea, was given as a tribute to philanthropist and patron of science, Andrew Carnegie. If the stately 20-to 50-foot saguaro could have talked to the alien, it would have had tales of the Old West to tell. Some have been around since Teddy Roosevelt became president in 1901. A few still living today were tiny young upstarts, perhaps growing under the shelter of a paloverde tree, when Thomas Jefferson was elected President in 1801. As big as this cactus grows, it is not the largest in the world. The saguaro is one of about 50 kinds of tree-form cactus found in the world's deserts. Some Mexican and South American species are taller and weigh considerably more. If you want to know whether a saguaro is full or thirsty, you can tell by its vertical pleats. Talk about water retention! The outer pulp can expand like an accordion, plumping without splitting, so the fleshy tissue can absorb a great quantity of water, sometimes increasing its weight up to 2,000 pounds. This turgid cactus would collapse without its interior framework of woody, tissue-like, bamboo fishing rods arranged in parallel lines to form a cylinder shape. This lightweight framework of ribs around the thick, whitish pith is surrounded by fleshy tissue. When the pleats are more deeply shadowed, more defined, drought has shaped the cactus. The plant can lose up to 82 percent of its moisture before it dies of dehydration. In times of little rain, shallow roots near the soil's surface can capture the moisture of even the lightest rainfall. The downward-pointing spines, "drip tips," also help by directing rainwater toward the base of the plant. These clusters of spines also play a role in cooling the outer skin; they help deflect wind and provide insulation from freezing as well. Conserving water loss is essential to the survival of the saguaro. When the sun beats unmercifully on its waxy, watertight, outer surfaces, microscopic pores close. At night, when temperatures are lower, the pores open, allowing for the entry of carbon dioxide, necessary for photosynthesis and the manufacture of carbohydrates. The saguaro can grow only in narrow environmental niches within the Sonoran Desert, usually below elevations of 3,500 feet. Freezing temperatures and frosts can kill or damage the delicate plant. Wild arms and drooping limbs may indicate that a particular plant survived a bitter winter. These distinctive human-like arms begin to grow only in middle age, about 75 years, after achieving a height of 14 to 16 feet. The oldest, with dozens or more branches, have marked the passage of many years. Another feature of the saguaro, the many holes on its body, makes one wonder if the Gila woodpeckers inflict much damage as they hammer into the tissues used to store water. Often, these meticulous birds drill 2 or 3 holes before they are satisfied. But the plant quickly minimizes damage by sealing off the wound with callous scar tissue to stop water loss. Another guest of the saguaro, the gilded flicker, is not always so benign. Flicker nests have been found in about 20 percent of all dead saguaro. Sometimes while pecking, they can break the internal framework at the joint of an arm , leaving it vulnerable in windstorms to loss of the limb. After the woodpeckers leave, welcoming hollows remain, where other birds nest and raise their young. Inside, where it is cooler by day and warmer at night, one might see the yellow eyes of a small screech owl; a pair may occupy the same nesting place for seven or more years. Shiny-winged purple martins and colorful house finches will also call the saguaro home for a time. Sometimes the non-native starling will dispossess native birds of their saguaro nests, leaving them out in the heat and cold. Red-tailed hawks and Harris hawks will nest aloft, from where they can see their scurrying prey sharing in the spring beneficence of the saguaro. Saguaros first blossom when they are 50 to 60 years old ( 7 to 8 feet tall), and do so for only one night. Crown-like clusters of creamy white flowers bloom near the ends of branches in May and June. These short-lived flowers, with an aroma similar to overripe melon, open fully by midnight. Suddenly, long-nosed bats will swoop out of the night sky to probe the just-opened blossoms for nectar with their long tongues. Pollen accumulated on their faces and fuzzy fur will be scattered to hundreds of other flowers before daylight. The following morning, bees and wasps will buzz deep into the funnel-shaped blooms, brushing against anthers, the pollen bearing part of the stamens, then flit to another flower. Harvester ants and butterflies will arrive and drink their fill as well. If you hear a bird atop a branch calling in a distinctive voice, "Who cooks for you," it is probably that primary propagator of the saguaro, the white-winged dove. By midday, the 24-hour flower closes forever. If pollination has occurred, a small fruit will begin to grow at the base of the flower. As temperatures rise in the desert, another sweet gift of the saguaro will tempt the hungry. When the fruits ripen, doves will consume large quantities of seeds. Looking for a tasty morsel, the kangaroo rat might soon arrive along with various squirrels, pack rats and pocket mice. These may shortly be driven away by larger coyotes, foxes and skunks. With so many feeding on the bounty of the saguaro, it is a wonder it survives at all. But the sheer numbers of seeds produced, sometimes more than 2,000 in an individual fruit, give the saguaro 40 million-to-1 odds in favor of reproducing. But more danger lies ahead for the vulnerable saguaro. Lightning strikes during the desert's wet season can take a large toll on the saguaro. 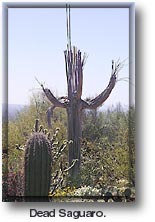 Bacterial infection may set in, and "saguaro rot" can cause death within a week. Other stresses come from humans. Target shooting, as well as wanton destruction and poaching of this protected plant are increasing problems. Urban sprawl is causing loss of habitat for the saguaro as well as for the its bat pollinators, upon which it relies. But there are promising signs for the survival of the saguaro as well. Cattle grazing in Saguaro National Park, with the ensuing loss of grass cover necessary to shade baby plants, has been remedied. Currently, there is no data indicating that the saguaro are declining in number. Nor is there any to indicate air pollution or ozone depletion are having any negative effect on the saguaro. By the middle of July, waves of heat will shimmer across the Sonoran Desert landscape. The air temperature will climb to 120 degrees Fahrenheit, while the surface temperature soars to 200 degrees. Empty husks of fruit will litter the desert floor where pack rats scamper, chewing over the remains of this year's banquet. One seed may drop from a whisker and land in the protective shade of a paloverde tree. A tiny new symbol of the West may beat the odds to take root on a stony bajada of the Sonoran Desert... Hopefully, standing tall in the year 2200, it will have its own tales of a New West to tell. And what will an alien visitor and the human generations of the future hear? Will the majestic and unique saguaro continue to speak the silence of the desert, or be forever silenced itself?